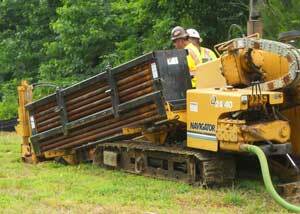 Atlantic Underground Inc uses horizontal directional drilling (HDD) to install underground pipes, telecommunications, conduits, fiber optics, sewer lines, water lines, gas lines, and other pipelines without disturbing habitat or disrupting traffic patterns. HDD is used because it has the least impact and is safer for the environment. It is also the preferred method on many installations due to lower costs, deeper installation, and shorter completion times. AUI has drilled through soils ranging from dirt and red clay to gravel and solid rock. 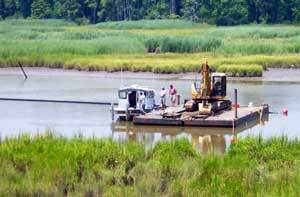 With horizontal directional drilling, we have crossed under protected wetlands, environmentally sensitive waterways, congested roadways, railways and buildings. We use only biodegradable drilling fluids and continually monitor for safety and efficiency. With over eleven years of experience and a solid reputation for reliability, AUI gets the job done when nobody else can. Prince George County: Directionally drilled approximately 6,000 linear feet of 6-inch HDPE pipe for Southwood Builders. King William County: Bored in 7200 LF of 6-inch forced sewer main in McAuley Park and Central Crossing subdivisions for RJ Smith Companies. Virginia Beach: Directionally bored and installed 16-inch water main under a creek in the roadway of Shore Drive for Tidewater Utility. Isle of Wight County: Directionally bored an on-grade 640-LF freshwater outfall for a municipality-owned reverse osmosis system. Isle of Wight County: Installed 1000 LF forced sewer main outfall into Lawnes Creek from a privately owned WWTP serving Lawnes Point Estates. This project was accomplished by coordinating professional barge and dive crews. All of the tooling changes were done in the creek, and the outfall was stabilized with riprap 10-feet below the water’s surface. Caroline County: Directionally bored and installed ~900 LF of 12-inch HDPE under a wetland along Rt. 1 for Godsey & Sons. New Kent County: Directionally bored and installed 12-inch water line under I-64 at a rest area from the westbound side to the eastbound side. Also installed 12-inch water and sewer lines under a wetland east of the rest area. Project completed for Southern Construction. Isle of Wight County: Directionally bored and installed numerous 12- and 16-inch water lines under Rt. 460, as well as other roadways and wetlands for Tidewater Utility. Isle of Wight County: Directionally bored and installed 6,000 LF of 6-inch forced sewer main for Branscome Corp. in Founders Run for East West Partners. Surry County: Installed 500 LF of 6-inch water main for fire protection to Claremont Plantation using HDD technology to cross a 90-foot ravine. Essex County: Installed 1200 LF of 8-inch HDPE on-grade sewer line for Enviroscape, Inc. AUI was approached about this project because the sewer needed to be 18 feet in the ground, along a major 4-lane highway, under an existing fiber optic and on-grade. Isle of Wight/King William Counties: Installed Dominion Power conduits for R.J. Smith Companies. Isle of Wight County: Bored in and installed water and sewer latterals in Lawnes Point Estate, a home subdivision on the James River for R.J. Smith Companies. "Based on Atlantic Underground's performance to date, Fluor-Lane looks forward to future opportunities to work together on new projects."